The knitting trend is being fueled by wonderful new yarns like ribbon, frizzy, eyelash, and metallic. 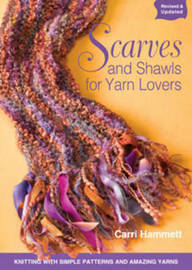 This book presents easy knit patterns that make the most of these irresistible novelty and decorative yarns. Knitters will learn the secrets of combining colors and textures while creating stunning accessories in no time. Each project has variations showing how different yarns will totally change the look. The easy knit stitches and techniques are taught step by step with photographs. Throughout, a yarn expert shares her tips to make knitting more enjoyable and successful. It is for both beginning knitters, who usually start with scarves and will love this way to take their craft to the next level, and experienced knitters, who are all yarn addicts! Carri Hammett owns a successful yarn shop and has an extensive background if fibre arts.